This is the first in a series of articles about food under global warming. This article takes a long view of the relationship between climate, agriculture, and class society. When people think of the impacts of climate change, sea level rise is often the first that comes to mind. Two recent studies have concluded that the loss of large parts of West Antarctica is now a question of when not if, with sea level rises of around 3 metres as soon as the next couple of centuries. New research also suggests that both East Antarctica and Greenland are more vulnerable than previously thought. The prospect of coastal cities, like Norfolk, VA, abandoned to the sea stirs the apocalyptic imagination, but the timescale is centuries to millennia. Food may turn out to be a much more pressing issue. The latest IPCC report suggests that climate change will reduce agricultural yields on average by up to 2% per decade in a context of demand rising by 14% each decade.1 With higher amounts of warming – business as usual could mean 3°C or more by 2100 – the prospects for agriculture get worse. And regional climate change can diverge quite significantly from the global average. With warming, things also get far less predictable, since anything above 2°C is unprecedented in the last million years (human agriculture has existed for around 10,000 years). Under scenarios of high levels of warming [business as usual], leading to local mean temperature increases of 3-4°C or higher, models based on current agricultural systems suggest large negative impacts on agricultural productivity and substantial risks to global food production and security. The future of food production therefore faces much uncertainty due to climate change. For many, the go-to common sense is Malthusian - overpopulation. There's simply too many of us, so someone [black, brown, poor, elsewhere] has to go hungry. For others, the solution lies in the extension of capitalist property regimes through the privatisation of agrarian commons, and the accelerated application of biotechnology to agriculture. For the peasant international La Via Campesina and their Western NGO allies, the solution lies in 'food sovereignty', empowering subsistence producers on the land. To address the future of food, it will first be helpful to consider the past. A long historical view offers important perspective on the relationship between climate, agriculture, and class society. The genus Homo emerged around 5 million years ago, while the species Homo sapiens, our own, the sole extant species of the genus, emerged around 200,000 years ago. Agriculture emerged only around 10,000 years ago. This transition, which took place independently in at least six global centres, is known as the Neolithic revolution. What relevance does ancient history, or strictly speaking, prehistory, have to today? We think there are two main points of relevance. First, the Neolithic revolution represents a dramatic, and ultimately global transformation of the mode of (social re)production, induced in part by climate change. As we face even bigger climate change, we think there are some important lessons about how such transitions take place. Second, there is a common association between the spread of agriculture and the rise of class society. We wish to challenge the 'common sense', promoted by popular writers like Jared Diamond, that we can have agriculture or egalitarianism, but not both. For the avoidance of any doubt, we do not discuss the transition to agriculture out of any desire to return to a hunter-gatherer mode of subsistence. Historically, such a mode of subsistence supported only around 5 million people, far short of the 10-11 billion likely to populate the Earth by the end of the century.2 A return to pre-agricultural living is neither possible nor desirable. But a long historical view puts contemporary questions of climate, food, and class society into the proper perspective. ...the post-glacial warming up of the climate entailed a progressive shift from a cold steppe ecosystem, characterised by the dominance of artemisia to a savanna ecosystem characterised by the dominance of oaks and pistachios, rich in wild grains (barley, spelt, emmer wheat, etc) and also other exploitable plant resources (lentils, peas, vetch, and other legumes), as well as various game animals (wild boars, deer, gazelles, aurochs, wild sheep, wild goats, rabbits, hares, birds, etc) and in some places fish. However, this abundance created only the potential, but not the necessity for a transition to agriculture. 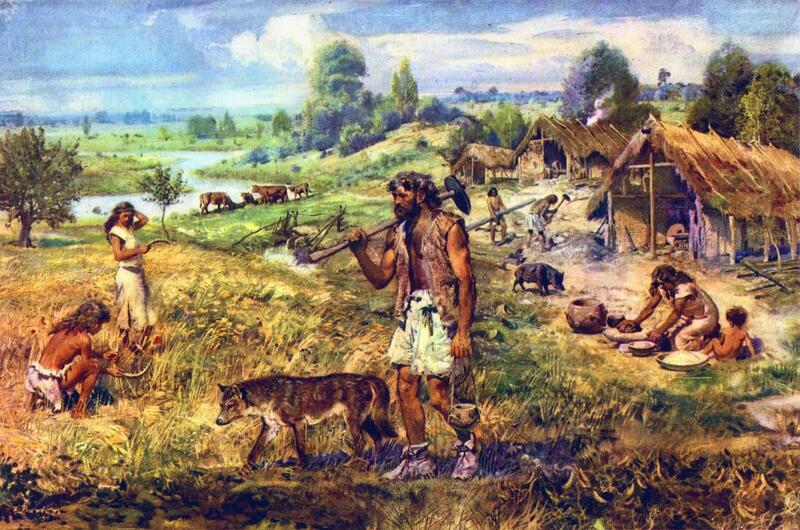 In fact, it is believed that agriculture would have initially meant longer and harder work than hunter-gathering. For hunter-gatherers, there was no distinction between work and play, and in fecund environments at least, only a few hours hunting or foraging each day was sufficient for a band to reproduce itself. For this reason, hunter-gatherers have been dubbed 'the original affluent society', since leisure was abundant and the work-play distinction absent. So why did they take up agriculture? It would be a mistake to generalise, since this process happened independently in widely dispersed places. Candidate factors include population growth exceeding the capacity of the environment or coercion. However, it would also be a mistake to dismiss agency, that is, choices to live differently. Agriculture did not emerge immediately following the post-glacial warming. The weakness of deterministic accounts is stressed by Mazoyer & Roudart, who insist that "as necessary as this revolution appears after the fact, nevertheless it cannot be explained by nor is it reducible to this necessity. "4 Furthermore, the knowledge, tools, and capacity for agriculture were present far before it was widely adopted. As David Cleveland writes, "it seems unlikely that a lack of basic knowledge prevented humans from taking up agriculture earlier. "5 In this respect, the Neolithic revolution was a break which occurred through the recombination of existing knowledge, tools, and social organisation into new forms of life. Jared Diamond's popular account links the calorie surpluses made possible by agriculture with the emergence of non-producing social strata, that is to say, the stratification of society into classes. For Diamond, “with agriculture came the gross social and sexual inequality, the disease and despotism, that curse our existence.”6 However, calorie surpluses were possible even in hunter-gatherer societies, and as one critique of Diamond points out, "there are certainly many non-state horticultural and agricultural societies. "7 Diamond's determinist account is probably the most influential, but it also has strong similarities with many Marxist ones (via Engels and Mumford), as well as primitivist or anti-civilisational perspectives (which accept the equation of civilisation with class society, and thus oppose both). A powerful critique of the Marxist version of stagism is set out by Gilles Deleuze and Felix Guattari.8 They draw on the work of anthropologist Pierre Clastres to reject the idea of history as a linear development from primitive to advanced stages.9 Deleuze and Guattari's critique rests on three points: (1) development seems to 'zigzag' back and forth rather than pass gradually through successive stages; (2) the archaeological record and anthropological theory supports the existence of sudden breaks and discontinuities, i.e. the emergence of a state or city without passing through all the supposedly intermediate stages, and; (3) what they call 'reverse causality', that is, the ability of something which does not yet exist to exert causal force on the present. We can extend the notion of anticipatory causality to the present. Just as the state haunts non-state societies and must be continually warded off, the dissolution of hierarchy haunts state societies. It too must be warded off, if the state is to reproduce itself. The modern state is the capitalist state: guarantor of private property and a major agent of capitalist development. The state is haunted by communism – stateless, non-market self-organisation. This helps to explain the violent repression of seemingly harmless public square occupations and disaster communities, as well as the constant xenophobic demonization and repression of migrants and the hyping of terrorism, among other things, as existential threats to the national body. The state is never established once and for all, it must continually ward off the threat of communism which haunts it. The emergence of agriculture, and civilisation itself, was made possible by climate change at the end of the last ice age. A few degrees of warming dramatically transformed ecosystems. Agriculture emerged in at least six independent centres, and cannot be explained by a linear, stagist account. Societies chose to revolutionise their mode of subsistence, albeit under circumstances not of their choosing. This revolution made use of knowledge and tools already present in hunter-gatherer societies, but recombined them in a new mode of (social re)production. The emergence of settled agricultural civilisations and class society was sometimes contemporaneous, but these were distinct processes. The earth only supported around 5 million hunter-gatherers and there is no going back. The challenge is to organise agriculture in a sustainable way to feed 10-11bn people. By sustainable, we mean a way which doesn’t undermine its own conditions of production, for example by driving climate change, making pollinators extinct, or depleting the soil. Ecological science is indispensable here. In future posts we will look at the emergence of specifically capitalist agriculture through enclosures, colonialism, and plantation slavery. Then we will be in a position to look at the current problems and future possibilities for feeding the world under unprecedented conditions of climate chaos. 2. This estimate comes from Mazoyer & Roudart (2006), A history of world agriculture: from the Neolithic age to the current crisis, Earthscan, p.65. 3. Mazoyer & Roudart, p.75. 4. Mazoyer & Roudart, p.98. 5. Cleveland (2013), Balancing on a planet: the future of food and agriculture, University of California Press, p.55. 6. Diamond (1987), The worst mistake in the history of the human race, Discover Magazine. 7. Antrosio (2011), The many origins of agriculture. Living Anthropologically, http://www.livinganthropologically.com/anthropology/many-origins-of-agriculture/. 8. See A thousand plateaus, proposition XI from page 427. They call this linear stagism 'evolutionism', meaning a gradual accumulation of small changes. This is in line with Darwin's view of evolutionary change. Writing in 1980 in French, Deleuze and Guattari were seemingly unaware of Eldredge and Gould's 1972 notion of punctuated equilibrium, which somewhat reconciles evolution with relatively rapid shifts at critical thresholds. 9. By contrast, primitivism accepts this historiography, but performs a normative inversion where the ‘primitive’ is good and civilisation is bad. 10. This kind of anticipatory causality features heavily in game theory, where not just present facts but future expectations structure decisions. A more contemporary example would be the fact the Cold War is incomprehensible without World War III – the prospect of nuclear Armageddon exerted causal force even though it was never actualised. A return to pre-agricultural living is neither possible nor desirable. But a long historical view puts contemporary questions of climate, food, and class society into the proper perspective. Edited to correct a typo: it gave the hunter-gatherer population as 500,000, it should be 5,000,000 (i.e. 5 million). This article omits a couple of important factors regarding the origins of class society, and furthermore puts forward a couple of fallacious notions. Firstly, there is no word on the role of mother-right in primitive communist societies, nor on the importance of the accompanying division of such societies into tribes and gentes (often with the intermediate phratries). This is not very surprising considering the fact that the scientific community still hasn't recovered from the reactionary assault led in the early 20th century against this theory of mother-right - a theory which, I might add, was broadly accepted until then. In contemporary scientific literature we do find reference to it, often in passing, with the usage of terms such as matrilocality, matrifocality and matrilinearity. However, these notions do not nearly constitute as holistic a framework as did the theory of mother-right in its origin formulation. This is not to say that Morgan (who was the first to develop mother-right beyond mere speculation and into a scientific account), nor Engels for that matter (who, along with Marx, accepted Morgan's general arguments and wrote his reflective 'The Origin of the family...' on the subject) were infallible. Indeed, many of the details in Morgan's prime work (Ancient Society, 1877) are dated, and his division of the history of society into the rigid stages of savagery, barbarism and civilization seems in retrospect quite naive. The same applies to Engels work (The Origin of the Family, Private Property and the State, 1884), though in a lesser degree, for he was already able to develop some of Morgan's notions by placing them in a historical materialist framework. Secondly, there is no word on the role of animal husbandry in the formation of class society. Cattle was one the first forms of means of production to yield a surplus product, and, more importantly, it was movable property, unlike the land used in agriculture. In many instances the formation of class society can be traced to the introduction of animal husbandry and the bequeathing of a father's movable property to his children instead of to the gens (which in itself presupposes the introduction monogamy and therewith the dawn of sexual inequality). Even today, in less developed parts of the world, cattle still plays an important role in exchange and as a measure of social status. Thirdly, you'd be hard-pressed to find any kind of "linear stageism" in Marx, unless you rely on the distortions by some of his more dogmatic interpreters. Of course, Marx often described historical stages of society, but these were by no means to develop linearly in the sense as it is used in the article, i.e. that these historical stages absolutely had to follow each other, had to necessarily develop into each other and that they would do so in an ever-progressing linear fashion etc.. For Marx these stages truly were historical in that they had come into being in the course of history under specific circumstances necessitating their development; consequently, if these specific circumstances were to be absent, their development would not take place (at least not as per the general historical modes of production Marx outlines). This conception is only linear in the sense that capitalism could only have developed historically out of a ripe feudalism, not in the sense that every particular social body must first go through the ordeal of feudalism before arriving at capitalism (Marx, in his Letter to Vera Zasulich, clearly refutes such views). Lastly, Deleuze & Guattari's notion of "reverse causality", at least as it is described in the article, is absolute nonsense. Obviously, there is no such thing as a "reverse" causality, as such would contradict the very notion of causality. Likewise it is impossible for "something which does not yet exist to exert causal force on the present". That the centralization of power constantly looms over the heads of egalitarian peoples, as this article posits, and that they therefore constantly seek to diffuse power through social practice to avert the realization of this threat, attests of no more than that the simple fact that tendencies towards the centralization of power are already present and that these peoples therefore apprehend this threat sensuously, in its actuality. Hi, thanks for the comment. Our aim here wasn't so much to give a comprehensive account of the origins of class society. That would require looking at the processes involved in each case, since there's no reason to assume they were all the same. Our aim is much more modest: simply to show that the emergence of agriculture and class society are not the same thing (and so by implication, creating an egalitarian society doesn't mean abolishing agriculture). A gendered division of labour may well have given rise to the first class relation, though there seems to be a lot of just-so stories and disagreement in this area. Again, there's no reason to assume this was uniform across hunter-gatherer bands, and as it doesn't relate directly to agriculture we left it out. We don't attribute a linear, stagist model to Marx (although you can certainly find instances of this kind of thinking at times). In terms of 'reverse causality', as ever, D&G's terminology invites such objections. We opted for 'anticipatory causality', which seems to better capture Clastre's discussion of mechanisms for 'warding off' centralised power. Hi, I enjoyed this article. However I looked over it a few times but I'm still not sure whether this is really shown or if it's just stated. "Agriculture does not necessitate class society." Then a quote from mainstream literature that says co-operation and self-organisation are possible. I mean, of course, I'd say the same thing too, but I'm not sure if anything here convinced me of that. Nor am I sure you could really cover that in this article... but then you summarised it as doing so. So... *shrug* Probably bad reading comprehension on my part. Still learnt some interesting stuff, like the role of climate change during the development of agriculture. And loved the passage about communism haunting the state. Really looking forward to the follow ups, cheers. Anthropologists had long documented herders and agriculturists featuring non-government forms of political organization, where leaders had no abusive power–the best leaders could persuade, but had no coercive authority. Classic examples of political organization in non-state societies include The Nuer for a pastoral society (Evans-Pritchard 1940) and the film Ongka’s Big Moka (Nairn, Strathern, and Strathern 1976). Antrosio (2011), The many origins of agriculture. Living Anthropologically, http://www.livinganthropologically.com/anthropology/many-origins-of-agriculture/. Catal Hiiyiik, in Anatolia, makes possible a singularly reinforced imperial paradigm: it is a stock of uncultivated seeds and relatively tame animals from different territories that performs, and makes it possible to perform, at first by chance, hybridizations and selections from which agriculture and small-scale animal raising arise. (...) the State is established directly in a milieu of hunter-gatherers having no prior agriculture or metallurgy, and it is the State that creates agriculture, animal raising, and metallurgy; it does so first on its own soil, then imposes them upon the surrounding world. Feinman goes on to say inequality cannot simply be an “epiphenomenon” of agriculture–inequality must be examined on its own terms, since social inequality can show up in non-agricultural societies. Moreover, agricultural societies can be relatively egalitarian. So in sum, there are examples of both agrarian and hunter-gather societies across the spectrum from egalitarian to inegalitarian. So agriculture is not a sufficient cause of social inequality (and state formation), and is not even a necessary condition for some degree of social inequality (though probably is necessary to sustain, if not to create a state, as even Deleuze and Guattari argue the emergence of a state quickly meant a shift to agriculture). Our aim here wasn't so much to give a comprehensive account of the origins of class society. That would require looking at the processes involved in each case, since there's no reason to assume they were all the same. I'm not suggesting they were absolutely the same, but there is a wealth of data on the subject that does suggest similar origins. Thus the dissolution of mother-right and with it gentile society is likely to have coincided with, among others, the rearing of cattle, and with this dissolution class society soon began its ascendance etc.. The origins of class society has not so much to do with the gendered division of labour, but more probably with the emergency of the monogamous family unit through inheritance in the patrilineal line, a form of association directly opposed to gentile society, and which has been marked from its inception by the inferior position of the woman in the household for the same reasons. We don't attribute a linear, stagist model to Marx (although you can certainly find instances of this kind of thinking at times). Then why refer to it as marxist? To do those who grossly misinterpret Marx a favor? To confuse people into believing that marxism somehow entails a "linear stagist" view of history? At any rate, such views aren't very common anymore even among the broad circle of self-styled marxists, except perhaps among some Stalinists somewhere; presenting this as the marxist view is more than just a little disingenuous. Also, I would honestly like to know where you did find in Marx instances of "this kind of thinking"? The man wasn't perfect, but one does not simply make such claims without actually proving them, y'know. In terms of 'reverse causality', as ever, D&G's terminology invites such objections. We opted for 'anticipatory causality', which seems to better capture Clastre's discussion of mechanisms for 'warding off' centralised power. I'd say 'anticipatory causality' just repeats the same mistake, but with a different wording. Why bother calling it a form of 'causality' anyway? There is only one kind of causality, it applies to everything in the universe, and it does not move in reverse. In any case, I don't necessarily agree with the notion behind the words. Egalitarian societies, without any prior knowledge of the state, cannot anticipate the state as such. As I already said, they may react to existent tendencies within their circle towards centralization of power, but these tendencies do not reveal themselves as moving towards a state as such. Moreover, it may not even be the case that this diffusion of power always happens consciously; in many cases it is simply a side-product of the unconscious reproduction of classless society. Besides, this supposed 'constant threat of the state' would only become an actual threat once the normal reproduction of classless society fails - say, for example, by the dissolution of mother-right, the emergence of animal husbandry, conditions of scarcity, extended periods of inter-tribal warfare and the consequent increased dependence on military commanders etc..
Re: mother-right, it seems to be controversial, with several feminist anthropologists considering it a myth reflecting more recent masculine assumptions and patriarchal mythology. Furthermore, matrilineal descent didn't necessarily mean women had power or property, only that social identity followed the mother's line (Frances Mascia-Lees and Nancy Johnson Black (2000), Gender and anthropology, Waveland Press, pp.52-55). It's not obvious that Engels was right on this. Given as it seems controversial in the anthropological literature and we could make the argument without it, it didn't seem worth going into as it would take an article in itself just to set out the controversy, let alone weigh it all up and take sides. Then why refer to it as marxist? Because Marx and Marxism are not the same thing, and because lots of Marxists still cite Engels as the go-to text on this, e.g. the SWP (until very recently the biggest Marxist organisation in the country). In terms of Marx espousing linear developmentalist views, the most obvious case is the Communist Manifesto, but it also crops up elsewhere (e.g. passages in the German Ideology). Some Marxists (e.g. Trotsky) thought this view was problematic and developed more multilinear accounts (e.g. uneven and combined development/UCD). You can find passages in Marx to back up either position if quote-mining is your thing. The latter kind of perspective seems much more fruitful (we plan to draw on a UCD critique of Brenner in a future piece on capitalist agriculture). Egalitarian societies, without any prior knowledge of the state, cannot anticipate the state as such. This seems a distinction without difference. If for state you read 'coercive power' you seem to agree with the argument? Re: mother-right, it seems to be controversial, with several feminist anthropologists considering it a myth reflecting more recent masculine assumptions and patriarchal mythology. Furthermore, matrilineal descent didn't necessarily mean women had power or property, only that social identity followed the mother's line (Frances Mascia-Lees and Nancy Johnson Black (2000), Gender and anthropology, Waveland Press, pp.52-55). That is why I speak of mother-right, though this word perhaps isn't the most adequate either. Matrilineal descent in and of itself does not necessarily signify anything greater than that kinship is traced through the mother line. Mother-right pretty much includes the notion that women had as much power as (if not more so than) men, as it is inextricably bound up with the institutions of gentile society. Another word that is often used is 'matriarchy', though this sounds way too much like a reverse patriarchy, which is quite contrary to the notion of mother-right (where sexual equality is the rule). It's not obvious that Engels was right on this. Given as it seems controversial in the anthropological literature and we could make the argument without it, it didn't seem worth going into as it would take an article in itself just to set out the controversy, let alone weigh it all up and take sides. So you choose to take controversy on such an important subject at face value? As I've said before, it is not so much a controversy as the result of an ideological assault at about the time when bourgeois theory itself had completely turned reactionary in the social sciences (which is anything but a coincidence). Forget not that most researchers working in the academic field, scientific as they may seem - including, unfortunately, many feminist and otherwise critical anthropologists - still often draw for their arguments on a body of knowledge which remains permeated as much by bourgeois ideology as the whole of society. Because Marx and Marxism are not the same thing, and because lots of Marxists still cite Engels as the go-to text on this, e.g. the SWP (until very recently the biggest Marxist organisation in the country). In terms of Marx espousing linear developmentalist views, the most obvious case is the Communist Manifesto, but it also crops up elsewhere (e.g. passages in the German Ideology). Engels wasn't in any way an adherent of a "linear stagist" account of history as described in this article; in fact his position on historical development was, as pretty much always, in accordance with that of Marx. The Communist Manifesto was a piece of agitational propaganda - not really a place to look for nuance or scientific precision. Also, "passages in the German Ideology" hardly constitutes proof, and since you're making the accusation, the burden of proof is on you. So, which passages are you referring to? Not that it would matter, since Marx's 'Letter to Vera Zasulich' clearly already illustrates that he wasn't all rigid in his thinking about historical categories of development. The notion of 'anticipation' remains inadequate in this context. Anticipation implies a conscious apprehension, while I argue that the diffusion of power in primitive communist societies for the larger part takes place unconsciously (in the sense that the people involved do not realize what effects their actions may have). Moreover, an anticipation of an actual 'coercive power' requires the condition that this 'coercive power' is known (i.e. sensuously grasped) in advance, which is perfectly possible of course, but eliminates the need for some different kind of ('anticipatory') causality to explain it. Whilst of course at a physical level causality must strictly happen in one direction, I'm not sure why the idea that mental conceptions and ideas of things which don't yet exist could exert an effect on current society is that difficult to believe. The example given in the footnotes of mutually assured destruction seems quite sensible to me, as would any number of capitalist reforms or defences against the anticipatory notion of communism. I agree entirely that anticipation requires apprehension, but why do you assume pre-state societies were incapable of conceiving of the idea of a coercive, hierarchical social organisation? Have you any evidence people were unaware of the effects of their actions and couldn't grasp anything they hadn't directly experienced? In terms of the accusation of stagism towards Marx, the piece describes Marxist versions of stagism, that phrasing doesn't imply Marx, or Marxism is inherently stagist, merely that there are stagist theories which are also Marxist, which as OOTW have subsequently described clearly exist. I agree entirely that anticipation requires apprehension, but why do you assume pre-state societies were incapable of conceiving of the idea of a coercive, hierarchical social organisation? I'm not saying at all that they were incapable of doing so, I'm merely saying that the diffusion of power probably happened for the larger part on an unconscious level, though not necessarily always. People were not always unaware of the effects of their actions and nowhere have I even suggested this. Again, I'm merely saying that the actions of people in a primitive communist society have many unknown and unintended consequences (just as in every society), among which is the consequence of the diffusion of power through social practice. ...and couldn't grasp anything they hadn't directly experienced? Here too you're putting words in my mouth. I never uttered the words "directly experienced", I said "sensuously grasped", which basically means 'experienced', whether direct or indirect. My point was that one cannot know something which has not been experienced in one way or another; to deny so would be idealist and hopelessly metaphysical. I'm perfectly aware of that, thank you. My point was that there isn't a whole lot of support these days among self-styled marxists for the "linear stagism" as described in this article, and that therefore to use this as an example is at best disingenuous, for it falsely represents what marxism in the broad sense is about today, and specifically what Marx himself and the undogmatic strains within marxism were always about (especially those that aren't too familiar with them will easily conflate the dogmatic "marxist" view of history referred to in the article with the views of the latter). But alas, such is the result if you rely on critiques from the likes of Clastres or Deleuze & Guattari. If the author(s) of the piece wanted to make sure that people knew that they weren't referring to all versions of marxism or even Marx himself, they could've easily done so. As it stands, the reference to the "Marxist version of stagism" remains fairly ambiguous on this question, and it's fairly naive to assume that everyone will just 'get it'. Why would saying some Marxists have dodgy stagist views mean 'all Marxists are idiots especially Karl!'? You seem to accept that Engels' schema of savagery-barbarism-civilisation is at best, dated. He got that from Mumford, and the piece explicity says its Engels/Mumford its criticising (including a hyperlink). And plenty of Marxists cite Engels, or are influenced by Jared Diamond. Also, Deleuze & Guarrari are Marxists themselves, albeit pretty leftfield ones. the particular brand of Marxism that Childe [Marxist who coined 'neolithic revolution'] brought into currency in archaeology is informed in large part by stagism and mechanical evolutionism. An approach based instead in the theory of combined and uneven development, which is taken to represent the true tradition of Marx, is novel. Personally, I'm not so interested in 'the true tradition of Marx' as useful Marx, but it seems strange to doubt there's such thing as Marxist stagism and that it's been a major current of thought (to the point that Trotskyists have to write articles claiming to recover 'the true tradition' in the form of uneven and combined development). so, reverse causality isn't strictly speaking causality, but the phenomenon D&G are describing is actually more common that linear causality. Dynamic processes are often organised by patterns - a common example would be an acorn is organised by the 'pattern' of an oak tree. The oak tree pattern 'causes' the development of the acorn into an oak, circumstances permitting (which is a big caveat). This is a very crude approx. of what happens, but this is what D&G are describing - the oak is 'virtual', and is a pattern that the acorn 'actualises' over time and through its relations with other process/entities. The state in D&G is one such social pattern that reoccurs throughout the last 10,000 years of human history. Göbekli Tepe Is even clearer evidence that Childe's "neolithic revolution" theory is historically upside down. There was a decent intro article on this in NS last year ("Hunter, gatherer… architect? Civilisation's true dawn" - unfortunately paywalled). In summary this massive complex which required the labour of groups larger than gens, and involves both complex architecture, sophisticated artwork and ostensibly developed culture/ideology/religion was constructed approx. 11,500 years ago. Before the introduction of agriculture, yet the genetic ancestor of modern wheat lies nearby at Mount Karaca. In short the imputation is that the large scale social organisation that produced the complex (including a kind of amphitheatre) helped bring about the domestication of grain (and possibly animals) due to the logistics of bring enough food into the locality to feed a large amount of people (both constructors and "celebrants"). There is no sign of permanent settlement (or local water supply). Göbekli Tepe implies that Meso- or Epipaleolithic society evolved a complex civilisation/society directly out of a hunter-gatherer mode of production, and this in turn led to the domestication of grain (and animals?) as a consequent. edit: non-paywalled article - Smithsonian: Gobekli Tepe: The World’s First Temple? The heart of the debate is about how to align the two interglaciations. Does it make more sense to count forward in elapsed time from terminations (and thereby align the current insolation minimum against a stage 11 maximum) or to align the present-day insolation minimum with its closest analog in stage 11? The first approach refutes the early anthropogenic hypothesis; the second confirms it. I'm not really able to evaluate the merits of each position so I think I err on the side of incumbent wisdom, though it's certainly an interesting hypothesis. On the other side, Jason Moore has been arguing we should be talking about the capitalocene, not the anthropocene, since it's capitalism in the last couple of centuries which has left a detectable geological trace, not a generic humanity. Firstly, there is no word on the role of mother-right in primitive communist societies, nor on the importance of the accompanying division of such societies into tribes and gentes (often with the intermediate phratries). This is not very surprising considering the fact that the scientific community still hasn't recovered from the reactionary assault led in the early 20th century against this theory of mother-right - a theory which, I might add, was broadly accepted until then. In contemporary scientific literature we do find reference to it, often in passing, with the usage of terms such as matrilocality, matrifocality and matrilinearity. However, these notions do not nearly constitute as holistic a framework as did the theory of mother-right in its origin formulation. That IS important! The patriarchal capitalist/marxist hegemony has mostly eradicated the mother-right consciousness. Let us not be complacent concerning the decay of our instinctual respect and love for our mothers, and their devoted and organic participation in our creation and nurturing propensity, which in a free society is allowed to blossom and refine the values of compassion and therefore design a more harmonious inter-relationship between its members. Freud was a Marxist and denigrated this tendency by classifying it as an Eodipus complex. Capitalists imprison their mothers in kitchens and deprive them of the company of their grandchildren, who they send to capitalist nursing homes! This is very disturbing and perpetuates the dysfunction of family relationships and values, producing emotional fractures and the alienation of youth .